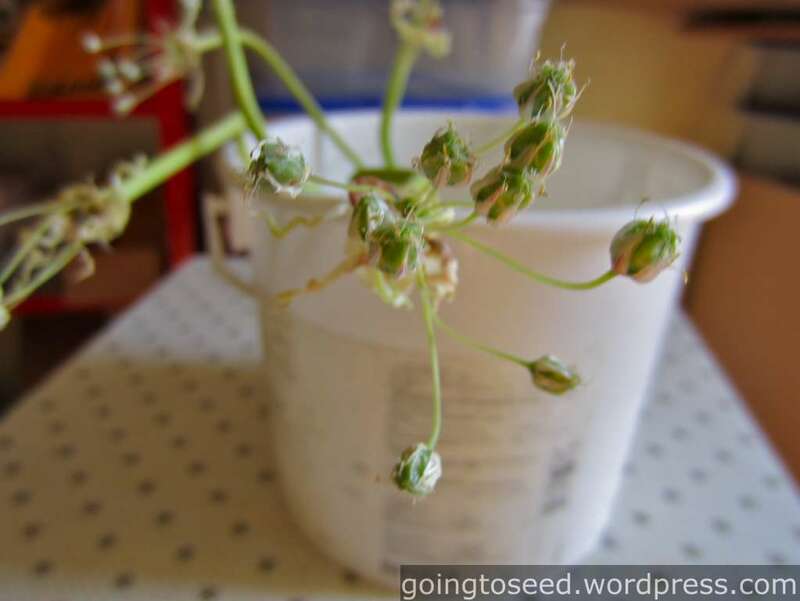 I already posted about this step in my true garlic seed primer. In this case though I removed the bulbils from harvested garlic scapes sitting in a bucket of water. It’s hard to remove every last bulbil the first time, especially the littlest bulbils. I tried to check regularly and remove any bulbils I missed. A few got away. These garlic scapes were harvested at the same time as those for garlic seed. 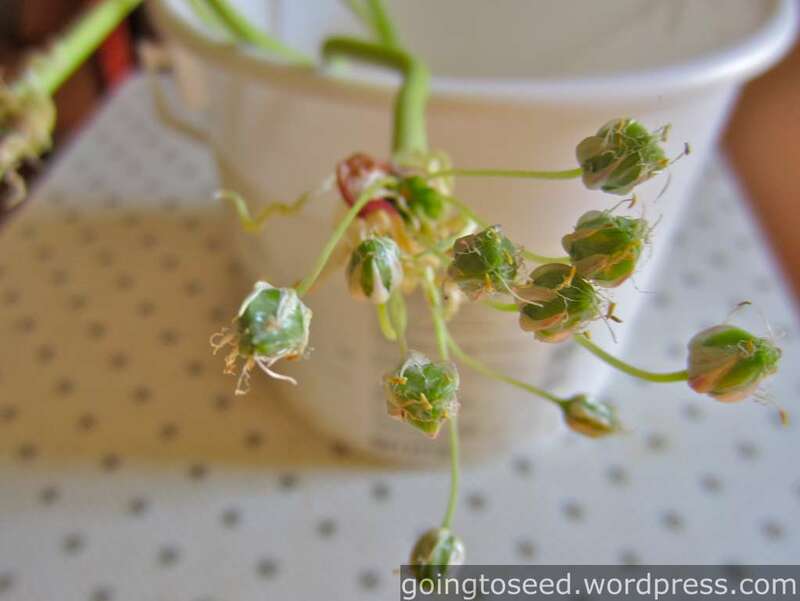 Their bulbils are fully formed and their flowers have long since dried up. This is when I got excited. At this point the garlic stems had dried up and the flowers were drying down though I still couldn’t see any mature seed. I cut the seed heads and put them in paper bags. 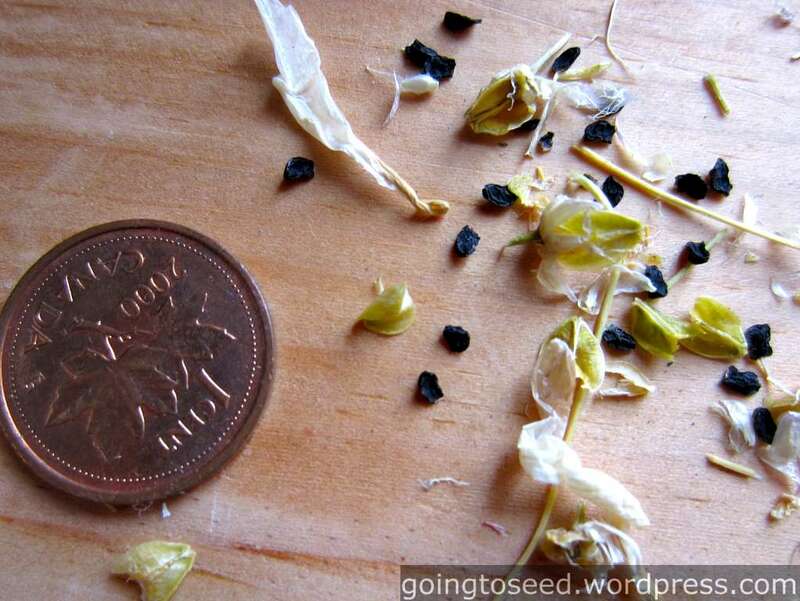 These garlic seeds came from a rocambole garlic named Quebec. Quebec is a variety we’ve been growing for years. My co-farmer Fred originally picked it up at farmer’s market but otherwise we don’t know anything else about its history. Well, I’ll keep you all posted! Great Work. Looking forward to further updates. Wonderful! Hope most of the seeds will grow for you, and you may get more generations. Cool to see that they made seeds. Looking forward to see how they grow. I can see garlic seed gets people excited! Thanks for the encouragement. I hope I’ve got exciting spring updates. Dan – Just stumbled on this while looking for info on true garlic seed. Amazing work – definitely going to try this out this year with a couple of my hardnecks. 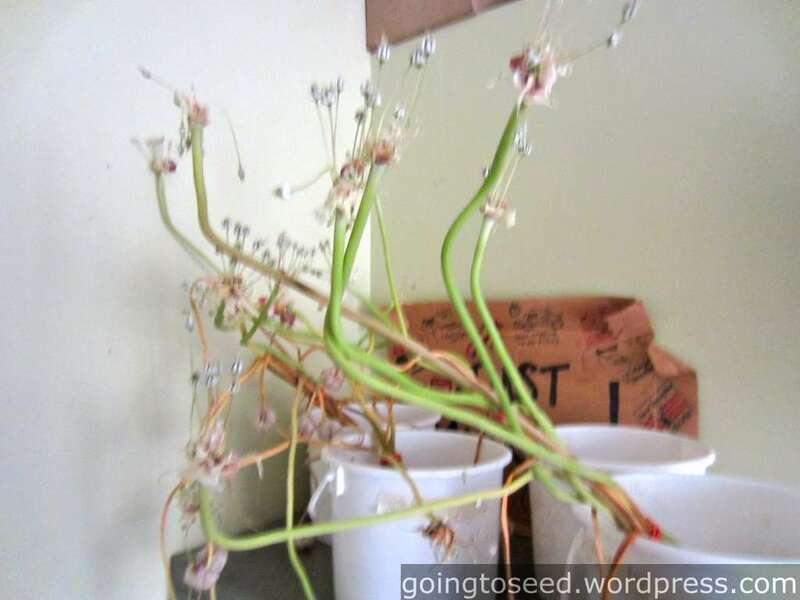 Good luck with this project – looking forward to seeing some garlic seedlings(?) this year! I’ll keep you posted on garlic seedlings. Though I have to admit I’m a bit late getting them started! I started my 3 seeds today. Super cool Daniel! I got some Northern Québec a couple of years ago, but most of us here in MB got hit with Aster Yellows last year and my NQ didn’t make it…well, just one bulb but it was stunted, coming up 2 weeks after everything else, and then it just didn’t grow. It never made it to harvest. Interestingly, the bulbils are acting the same way. Can’t quite figure that out. Harvested all my garlic today and yesterday. All hanging now. The variety that produced seed was a Rocambole named Quebec – this is different from Northern Quebec which is a Procelain garlic. I have never found any other reference to the Quebec rocambole strain. It’s probably something somebody renamed at some point. There has not yet been a follow up post to this one. I haven’t got around to writing one. Though I can tell you my garlic seed didn’t germ. I’m trying to produce some more this summer. There is a search box in the right sidebar of my blog that will bring you to just about anything you’re looking for. Hi. I just must tell you that all our rocambole bulbilcapsules this year have flowers. Even one capsule does not have a bulbil but only flowers. And not only rocambole flowers, all our other sorts og hardnecks shows small flowers in between the bulbils. I didn,t believe my eyes, because they should not flower!! We live in Denmark and we have grown garlic since 2011. This year we have had an very dry and hot summer in opposite to the two last years. So maybe a very big variation in termerature can trigger the flowering? We have bought our rocambole from a lady WHO bought the bulbils on Farmers Marked in New York, so no one of us knows wich kind of rocambole we grow. 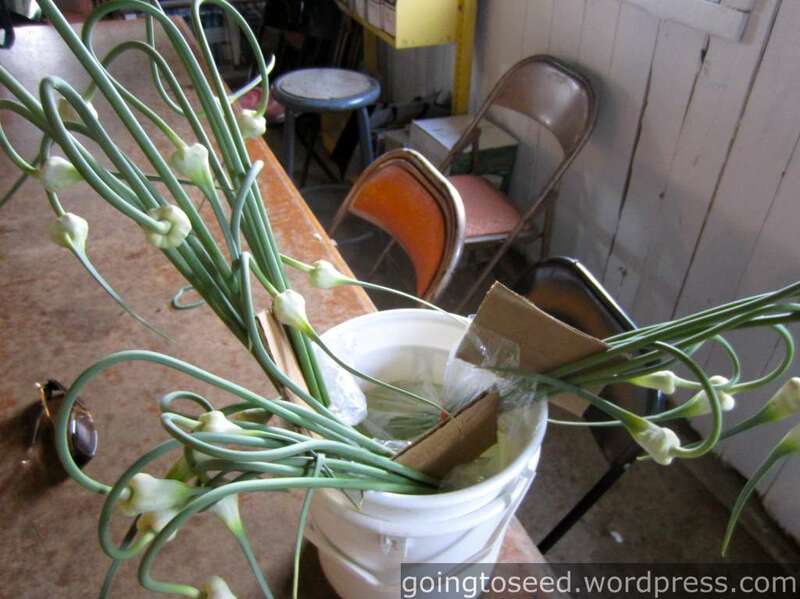 Garlic scapes often have small flowers between the bulbils but then the flowers dry up. 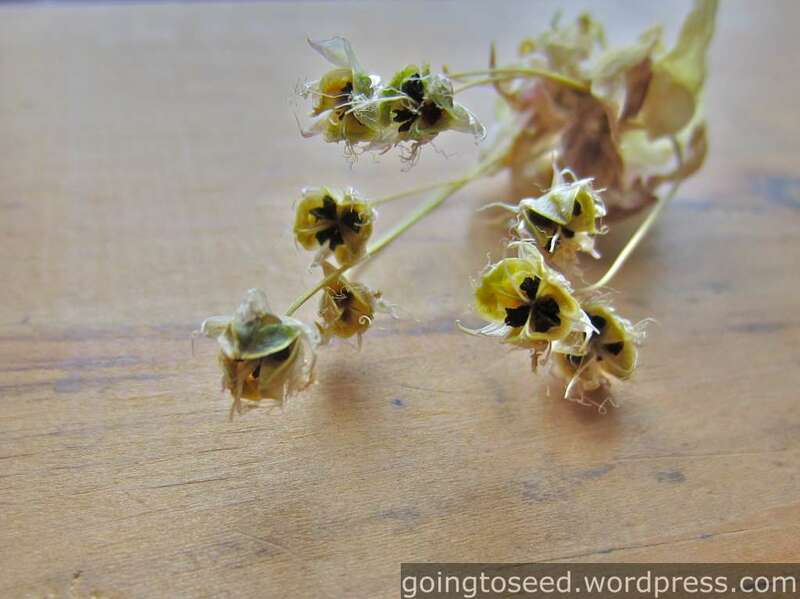 To keep the flowers alive and get seed, you probably need to remove the bulbils. It sounds like one of your rocamboles is doing that on it’s own! 3 of them does not have any bulbils at all. They only have flowers. I have kept the stemes so I can take Pictures of them. If you are interested I can send you some Pictures so you can see them. Yes I know that in between the bulbils we often see some small single flowers. the Purple stripes ones also this year have unusual lots of flowers. I didn´t think about it before I saw your articel. Then I looked throug all our crops and found out, that all our garlic flowered unusual much this year. Have you any experience in, why they flower moore some years? Have you seen if a very hot summer has a inpact? I generally find that the number of flowers is proportional to the number of bulbils. A scape with a lot of bulbils has a lot of flowers and a scape with few bulbils has a lot of flowers. Previously, I hadn’t noticed that hot summers had an impact. However we are having a very cold summer and this year we seem to have fewer bulbils and consequently less flowers. I do not know if there is a correlation but it does seem to line up with your observation. Though it does not explain your scapes without bulbils. I would love to see some of your pictures. Hi. I just must tell you that all our rocambole bulbilcapsules this year have flowers. Even one capsule does not have a bulbil but only flowers. And not only rocambole flowers, all our other sorts of hardnecks shows small flowers in between the bulbils. I didn,t believe my eyes, because they should not flower!! We live in Denmark and we have grown garlic since 2011. This year we have had an very dry and hot summer in opposite to the two last years. So maybe a very big variation in termerature can trigger the flowering? We have bought our rocambole from a lady WHO bought the bulbils on Farmers Marked in New York, so no one of us knows wich kind of rocambole we grow. Does anyone have any true seed available? I am willing to pay for it and exchange information. I am interested in allowing two types to go to seed and possibly cross pollinating. Has anyone tried crossing two strains to possibly rejuvenate the genes of the plants to make them start to actually seed on their own again, via genetic diversity, similar to a more natural environment. I believe the lack of genetic diversity is part to blame. Even though the cloves currently being used in commercial operations are genetically identical, I think allowing some actual natural diversity and plants to go fully through their cycle we can eventually pull the plant out of this mess and have plants that once again actually go to seed. 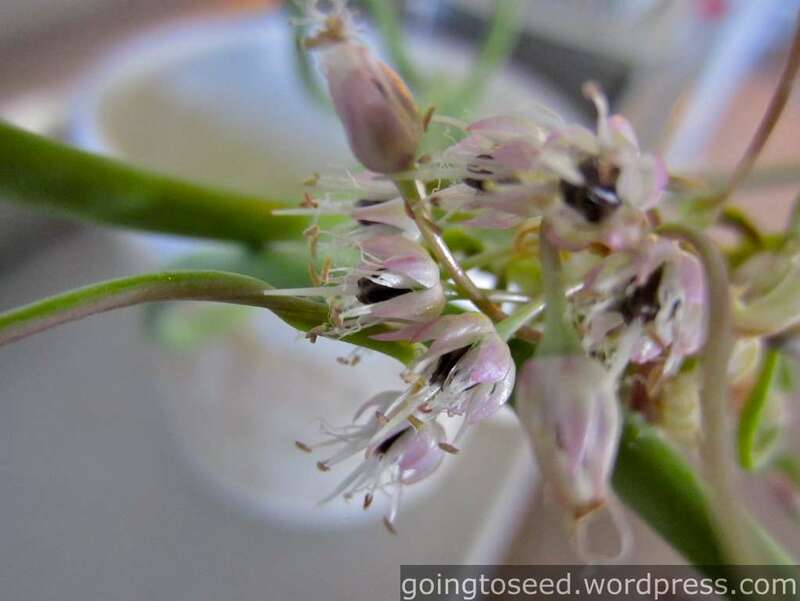 Have you read my most recent true garlic seed post? 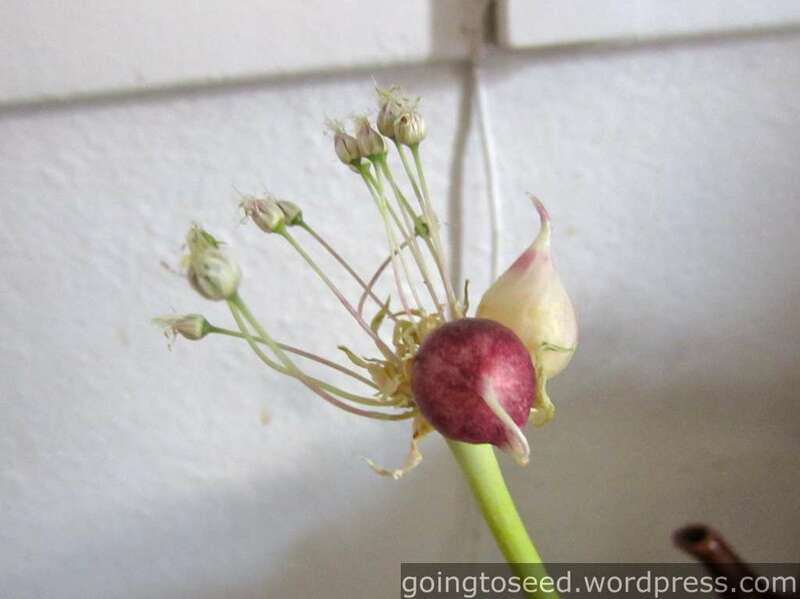 https://goingtoseed.wordpress.com/2013/10/10/2013-true-garlic-seed-update/ I mention Dr. Ivan Buddenhagen has limited quantities of true seed for sale at $25 per 100 seeds. His website is http://ivansnewgarlics.com/Home.html. Getting more diversity into garlic is definitely going to give us more options to adapt to all kinds of conditions though it is amazing how resilient garlic can be with it’s current genetics! Not sure if you are still on here. I’ve taken a break from trying to get true garlic seed. Maybe next year! I’m thrilled to hear that you have gotten some garlic bulbs from seed. Do you have any pictures? Hello. Sorry to tell you, that all our garlic went bad this year. We had a very wet winter 2014-15. It rained from october to februar and our garlic stood for months in water. So most off it ruttened or went sick. We have started up with new stock this winter, and we also have drained our garden. Some of our raised beds have got new places, so now we hope the garlic will survive. Funny, that one sort of Rocambole allways is flowering, som did not get any bulbils but only flowers. Other sorts like “Porcelain” can get lots of flowers in between the bulbils, but there flower is not like the ones on the “Rocambole”. Sadely I only know that this particulary “Rocambole” was bought on Farmers Marked in New York, so it can be just any one of the “Rocamboles”. I have got some new cloves from a friend who got some of mine the year before, so I will still grow the same “Rocambole”. Did I send you pictures of the ones that flowered two years ago? My husband took some nice pictures. So if you are interested, I can send them for you. Hi Juana, I’m sorry to hear your garlic didn’t do well this year. The standing water doesn’t sound like it did any good to the garlic. It probably accentuated any diseases taht you might have in your garlic patch. If you have the space, it would probably be good to rotate out of those beds for a few years. Otherwise you might infect your new stock. I don,t think you sent me those pictures. I’d love to see them! I did read about that, and actually got into contact with Ivan. I didnt really like the idea of not knowing exactly what the new strains he had were crosses of. I asked but that question was skimmed over. I am interested in starting a few strains of my own, that I know the origin of. I have never seen a plant that was grown from any sort of clone that was even close to being as vigorous as a plant grown from seed. I believe that seed will be the best option for efficiency once the genetics are back on track. I still haven’t had any germination from my true Garlic Seed. 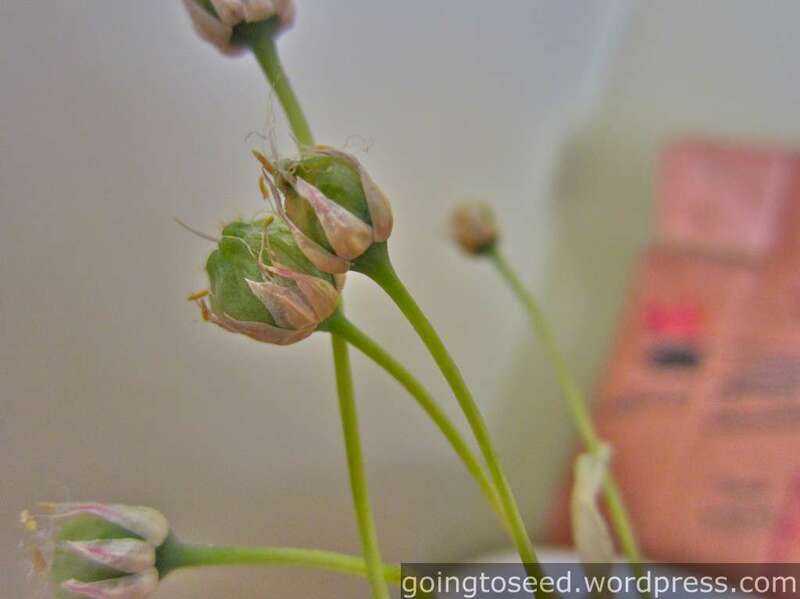 I took this year off from trying to force scapes to produce seed. I’ll probably try again next year! It is important to be clear that true garlic seed and garlic bulbils are not the same thing. Garlic bulbils have no pollination because they are genetic clones of the mother plant. They take a few years to produce big bulbs because each year the bulbs are a bit larger than the previous year. 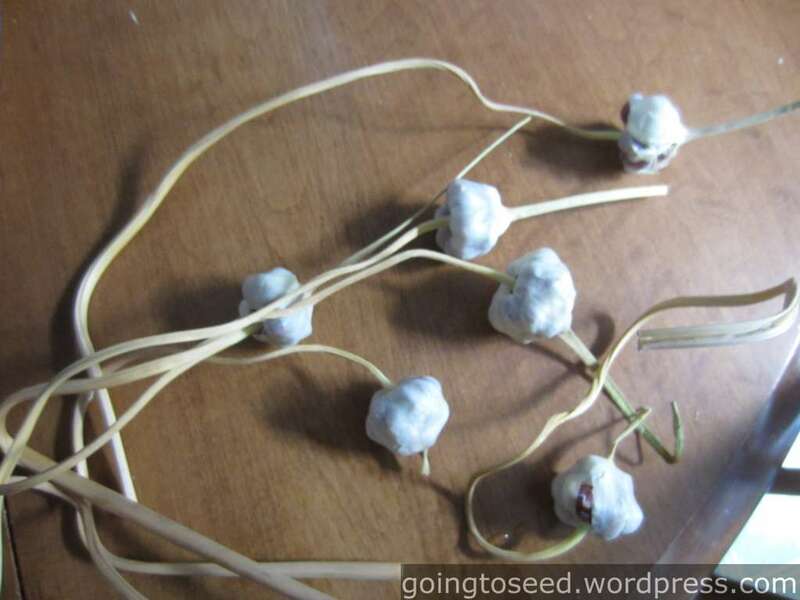 I posted about how we’ve increased our Siberian garlic starting with bulbils. It is quite easy to propagate from bulbils. I would encourage you to do so!